Each ELLIOT & OSTRICH piece is handmade with care and precision once your order is confirmed. Production of Collection (e-shop) items can take 4-6 weeks depending on the design and type of gemstones used. If you are celebrating a special moment causing your order to be time sensitive, please contact us at moc.h1556051942cirts1556051942odnat1556051942oille1556051942@olle1556051942h1556051942 and we will do what we can to meet your deadline. After your order is placed, you will receive an email confirming your order. If you do not receive this within 24 hours, please contact us at moc.h1556051942cirts1556051942odnat1556051942oille1556051942@olle1556051942h 1556051942and we will respond the next business day. After the order is shipped, you will receive a second email confirming the shipment and a tracking number to track your shipment. Each Bespoke piece is one of a kind and created in close collaboration with Jennifer Elliot. The budget for a Bespoke creation starts at 3500 euro. The lead-time depends on the type of project, the speed of decision making and the rarity of the desired gemstones. For any questions about the process and timings, please contact us at moc.h1556051942cirts1556051942odnat1556051942oille1556051942@olle1556051942h 1556051942 or by filling in the contact form in the Bespoke section of the website. In case you are ordering a ring and are not aware of your ring size, we offer you the following recommendation. In case you are ordering for someone else, we suggest finding a ring which fits her well and going to option 2. 1. You can order a ring sizer by contacting moc.h1556051942cirts1556051942odnat1556051942oille1556051942@olle1556051942h1556051942 which will be charged at shipping cost. 2. You can find a ring which properly fits the intended finger. Engagement and wedding rings are traditionally worn on the ring finger on the left hand. Be aware that the size of the fingers on the left versus the right hand can differ significantly. Be sure to measure on the hand where you intend to wear the ring. Be aware your hands are broader in the summer than in the winter due to heat. In case of doubt opt for a larger size. If you do not have a ring, take a piece of string. Tie the string around the finger intended for the ring. Do not tie too tight, leave some room for movement and swelling. 2.1 Measure the diameter on the inside of the ring. You can measure with a ruler from side to side or draw a circle with a fine pencil on the inside of the ring. Measure precisely and capture the largest amount of millimeters. 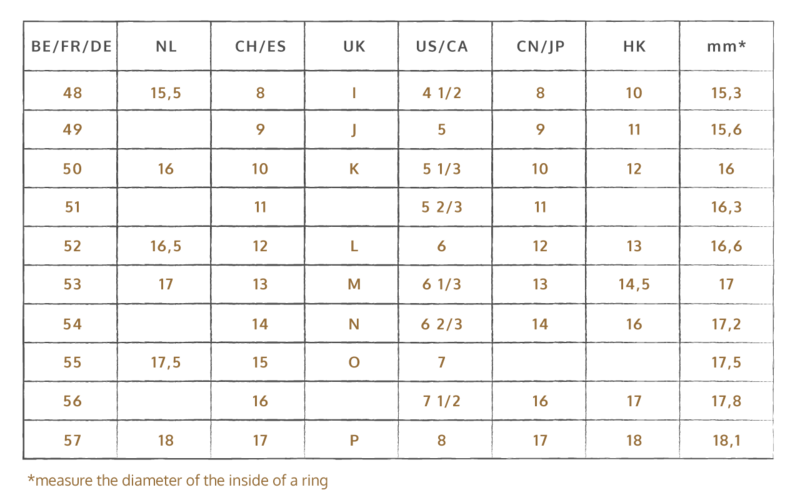 2.2 Consult our ring sizing chart below to find the right size. Keep in mind that considering we offer customised jewellery pieces, you can’t correct, exchange or return the items ordered (for example in the case of an error of size or text). We offer necklaces in 3 sizes. 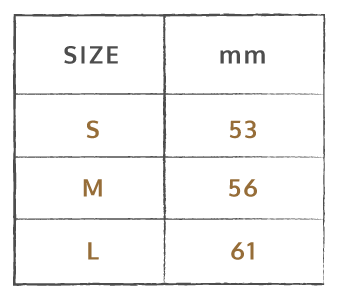 Please consult our necklace sizing chart to see what each size looks like. – Princess: 40 – 45 cm (18”). Ideal for fine pendants because they sit high on the chest. Goes well with a fine blouse or round/V-neck t-shirt. 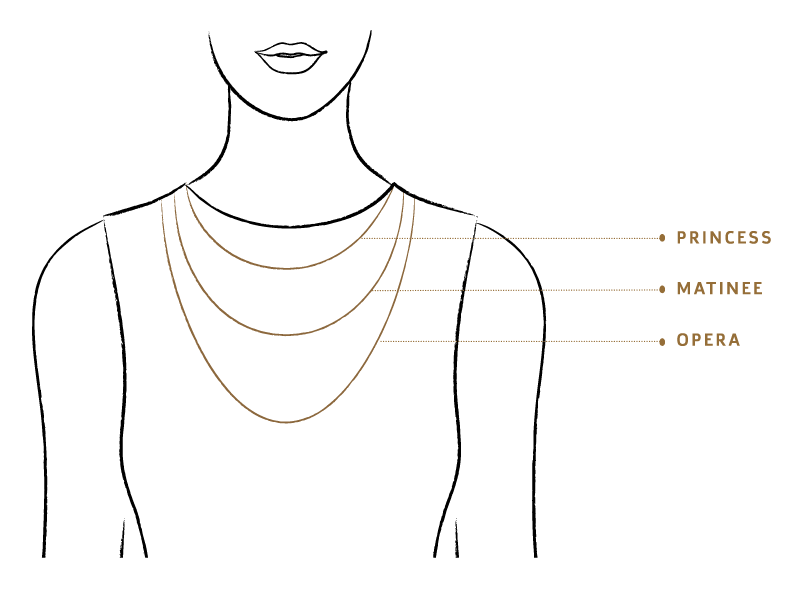 Elegantly compliments collar bones. – Matinee: 55 – 60 cm (22”). Ideal for larger pendants and for wearing over a collar or high neckline. Goes well with a cashmere top or fitted top to make the necklace pop. – Opera: 70 – 75 cm (30”). Ideal for wearing over a high-neck, roll-neck or casual t-shirt in summer. Adds a touch of drama and nonchalant elegance. Tip: stack several layers of fine pendants to create a unique look. At ELLIOT & OSTRICH we take pride in making your meaningful moments memorable. All jewellery by ELLIOT & OSTRICH arrives in a refined leather jewellery box with a complementary gift card and suede jewellery gift bag. We advise you to write down the reason why you are gifting this meaningful piece so you can cherish this moment forever. If you wish to receive an invoice in favor of your company, please contact us at moc.h1556051942cirts1556051942odnat1556051942oille1556051942@olle1556051942h1556051942 and we will be pleased to help. Online orders are shipped and delivered Monday through Friday, excluding major holidays. Shipping within Belgium can take up to 4 business days. For deliveries to neighbouring countries (The Netherlands, France, Germany, Luxembourg) it can take up to 5 business days, all other destinations can take up to 15 business days. Elliot & Ostrich offers complimentary ground shipping within the E.U. Shipping outside the EU will be charged at cost. For information, contact us at moc.h1556051942cirts1556051942odnat1556051942oille1556051942@olle1556051942h1556051942. Any problems concerning the items delivered (damaged, missing articles, broken or faulty items, etc.) must be communicated to moc.h1556051942cirts1556051942odnat1556051942oille1556051942@olle1556051942h1556051942 within 3 days (including public holidays) after delivery (as per postmark). Goods sold are non-refundable. All items are custom made to order therefore exchanges or returns are not offered for change of mind. We recommend that you confirm appropriate sizing according to our guidelines prior to placing your online order. Elliot & Ostrich covers the cost of reasonable repairs under normal wear for the first six months after purchase. If a piece shows signs of improper care or is damaged in a way resulting from something other than normal wear, we will repair the piece at cost. An estimate of the repair can be given prior to the repair. After 6 months, we will repair pieces at cost. Any necessary repair of Bespoke pieces will be assessed on a case by case basis. Customers are responsible for return shipping costs and liable for any damage, loss or theft incurred during transportation or repair. Please note that if any other jeweller undertakes work on one of our pieces, including resizing or repairs, this warranty will be voided. We strongly recommend returning to us for repairs and resizes, we do not take any responsibility for repairs or resizes undertaken by other jewellers. Resizing is at cost and is quoted on a case by case basis. Please contact us prior to returning your piece, and ensure that all of your details, including your order number and return address are included. If you are returning a piece for resize, please ensure the new size is included and has been accurately measured. If you lost an earring, our ability to make a mate is dependent on availability of materials. In order to ensure a best possible match, we request that you send in your remaining earring to be used as a guide. We recommend using a courier service with full insurance to return your piece. Please ensure the shipment requires a signature on delivery and the piece is adequately packed and padded (as plain as possible without any logo or mentioning of jewellery). We will not accept any liability if the piece is damaged in transit due to poor packaging. We will let you know once we have received your piece, to give you an indication of any cost involved, and expected timeframe. For queries regarding repairs and resizes, please contact moc.h1556051942cirts1556051942odnat1556051942oille1556051942@olle1556051942h1556051942. For any general inquiries or questions about orders placed on this website contact us at moc.h1556051942cirts1556051942odnat1556051942oille1556051942@olle1556051942h1556051942.